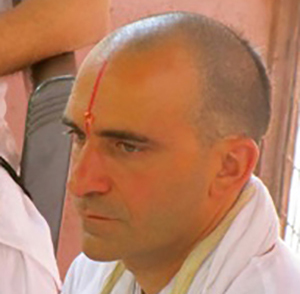 Ashoka Tilakasuta is personal student of the Venerable Master Swami Shankaratilaka, Rector of the Vaidika Pratisthanam – Orthodox Yoga School of the Saraswati Order – lineage of Adi Shankaracharya. Ashoka showed natural inquisitive mind about existence, philosophy and healing since his teens. In more than 20 years, genuine interest in ancestral knowledge and wisdom brought him in contact with different traditions, including Yoga, Reiki Healing, Shamanism, Buddhist Zen and Sufism, amongst others. After leaving Italy in 2005 he had the privilege to study traditional Mayan medicine in Mexico and Thai therapeutic techniques in North Thailand, before being blessed by his Master at the foothills of the Himalayas, with teachings on Yoga, Vedanta and Tantra. Ashoka is today a yogi and executive, devoted to the cause of spirituality and self-realization through the application of pure traditional teachings to modern life and mindset.